OA Trail Crew is an opportunity for arrowmen to provide service to the trails at El Rancho Cima in preparation for summer camp. This may be the last year OA Trail Crew is offered at El Rancho Cima so it is an excellent opportunity to see the camp as a trail crew member. OA Trail Crew is modelled after the National High Adventure Base programs at Philmont and Northern Tier. It is also an opportunity to learn how to do trail and conservation projects. 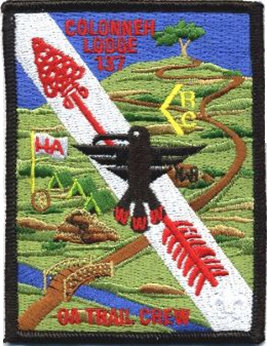 OA Trail Crew is open to all arrowmen 14 years of age and older. You spend the day on the trail and the evenings in brotherhood and fellowship with your fellow arrowmen. Trail work makes you hungry so there are great meals prepared for you to enjoy and get reenergized. Arrowmen also get to spend time exploring El Rancho Cima. The work and fellowship is a lot of fun; especially if you bring a fellow arrowmen from your troop or chapter to enjoy the experience. You see the patch! – They are only handed out at OA Trail Crew. Sign up today for Brotherhood and Cheerful Service to El Rancho Cima. The registration fee is $45 and includes meals and a special patch. The weekend fee is $30. The OA Trail Crew begins on Friday night. Check-in after 7:00 pm. The event ends on Tuesday morning at 11:00am. If this is not your spring break week, join us for the weekend.